Yankees Season Preview: So Who Exactly Will Be in the Rotation This Year? If the Knicks end up not making the playoffs at all this season — which has an increasingly high possibility of happening — one, as a matter of explanation, will look to the injuries of Jeremy Lin and Amar'e Stoudemire, to the mid-season coaching turmoil, to the truncated and chaotic lockout-shortened schedule. But it's possible, when it's all done and over, one can simply look at last night's game in Indiana. If this all falls apart, or if the Knicks come up just short, this one will be the killer. 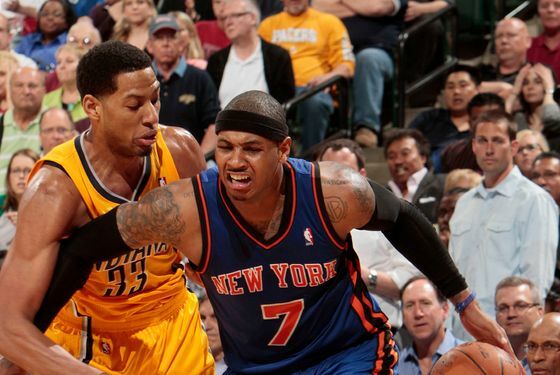 The Knicks lost 112-104 to the Pacers in Indianapolis last night, but it was much worse than that. It was a game that the Knicks, in almost every possible measure, dominated: Their defense was masterful in the second and third quarters, Carmelo Anthony was the unstoppable offensive machine that he becomes when he's engaged and on his game, and even Landry Fields was hitting shots. With 55 seconds left in the third quarter, Steve Novak drained a three-pointer, and the Knicks had a seventeen-point lead — on the road, against a playoff team, without two of their starters and best players. It was enough to make you feel like this was all gonna be all right, after all. And then the Knicks imploded. It was as if the Knicks suddenly lost all their superpowers, all at once. The offense, so smooth and free-flowing at its best (and boy, Baron Davis is so not a part of that "at its best" lately), clogged up, reducing itself — again — to Toss It to 'Melo for a Forced Isolation Play time and time again. The Pacers got hot, too, draining three-pointers thanks to some suddenly lax perimeter defense. It happened extremely fast; an 87-72 Knicks lead at the beginning of the fourth became an 89-88 lead in roughly four and a half minutes. A minute after that, the Pacers had the lead, and they'd never get it up. It was downright gruesome. The Knicks just melted, at the worst possible time. It really is the worst possible time, by the way. The Bucks won last night, so they're now only a game and a half behind the Knicks with a dramatically easier schedule the rest of the way. How much easier? The Knicks are now at .500 with a road game against Orlando tomorrow, a home-and-home with the Bulls next Sunday and Tuesday, and a massive road game against the Bucks a week from today. This is when everything matters. Last night was one they needed to lock down. They didn't. And now everybody wants to talk about John Calipari. These Knicks are exhausting.